Tuscany is one of Italy’s most beloved regions, known for its rolling hills and towering cypress trees. Its capital Florence, the birthplace of the Renaissance, is considered its crown jewel. During your Florence Highlights Tour, your private guide from Italy’s Best will show you around this fabled city, which has had an instrumental role in many facets of Italian history from its cultural heritage and spectacular art to its prominence in the fields of fashion and finance. In the Piazza del Duomo, the heart of Florence’s historic and religious center, see Brunelleschi’s pink, white and green marble exterior of Santa Maria del Fiore, better known as the Duomo. Its magnificent russet dome and the adjacent Giotto-designed bell tower are two signature components of the Florentine skyline. The Baptistry – known for its elaborately carved doors – is located just a couple of paces west. 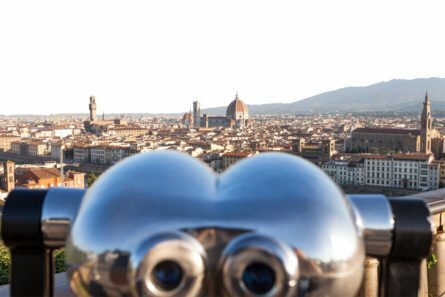 Walk in the footsteps of the great artists through the tiny streets and see the vibrant, Piazza della Signoria. The fountain-and-statue studded square has been a local gathering place for many generations as well as the city’s political center since the Middle Ages. The 13th-century Palazzo Vecchio, once the palace of Cosimo I de’ Medici, is now Florence’s city hall. Outside stands a replica of Michelangelo’s David, which had been displayed here prior to its 1873 relocation to the Accademia. Pass through the square, walk along the Arno River and cross the fabled Ponte Vecchio (old bridge) where many of city’s high quality jewellers, have been selling their sparkling creations since the 1500s. Having survived World War II and the great flood of 1966, this bridge is rife with history and a must-see for all visitors.